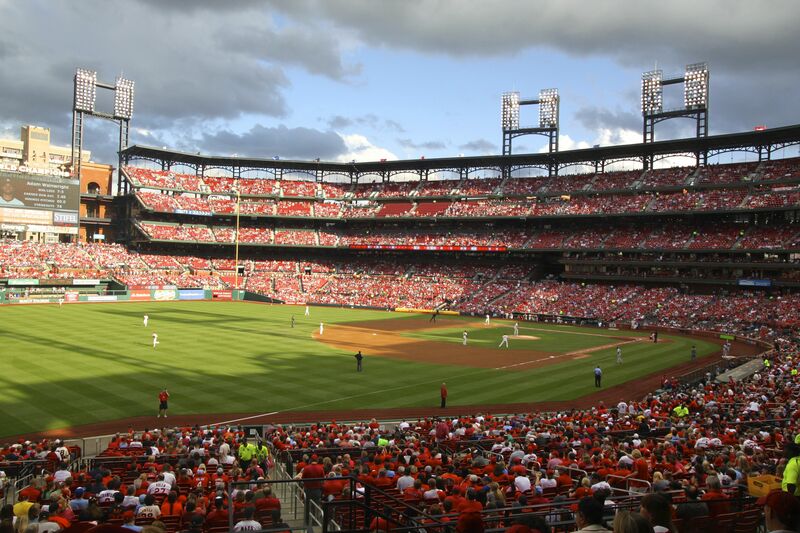 This June we traveled back to the Midwest to visit family and see a few baseball games. We had a great time visiting with my family. We also were lucky enough to watch baseball in 3 of the great parks in the Country. This blog is a day by day record of the vacation. 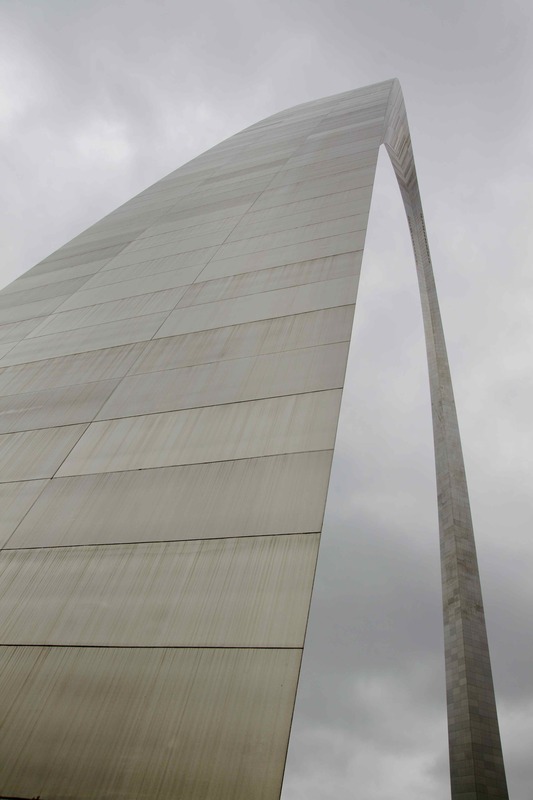 Sunday June 02: In St, Louis. Breakfast at St. Louis Bread Company (Panera). Visited Grant’s Farm. Rode the tram and saw the Clydesdales. Lunch at St. Louis Bread Company. The Mississippi bridge at Alton was closed because of flooding so we drove to Monmouth via US 61, Hannibal, Quincy, and Macomb. Freeway all the way to Macomb. Staying at Americas inn. Built where Mellings used to be. Visited Sally and George. Monday June 03: We traveled to West Branch Iowa and visited the Herbert Hoover Presidential Library and Museum. After arriving at West Branch we lunched downtown at Reid’s Beans. It is a small quaint joint with no published menu. The menu changes every day and contains a limited number of items. 6 the day we dined there. If your ever close to West Branch and hungry I recommend them. After lunch we paid our $3 and toured the Museum. I learned a great heal about Herb. He was truly one of the giants of the 20th Century. And the $3 was a great deal you can only find in Iowa. Monday evening we had dinner with Sally and George’s family and Jerry at the Longhorn Steakhouse in Peoria. A good time was had by all. Tuesday June 04: Another day visiting family in Monmouth. We all drove to Davenport North Park today and shopped. After we arrived back in Monmouth we visited the Monmouth Wine Bar – Market Alley Wine. It was a pleasant surprise and pretty busy for 4PM! Since it was our last night in town Gwen and I dined at Cerar’s. The meal was great as usual. Whenever I visit Monmouth I wonder how a restaurant this good survives in a town as small as Monmouth. 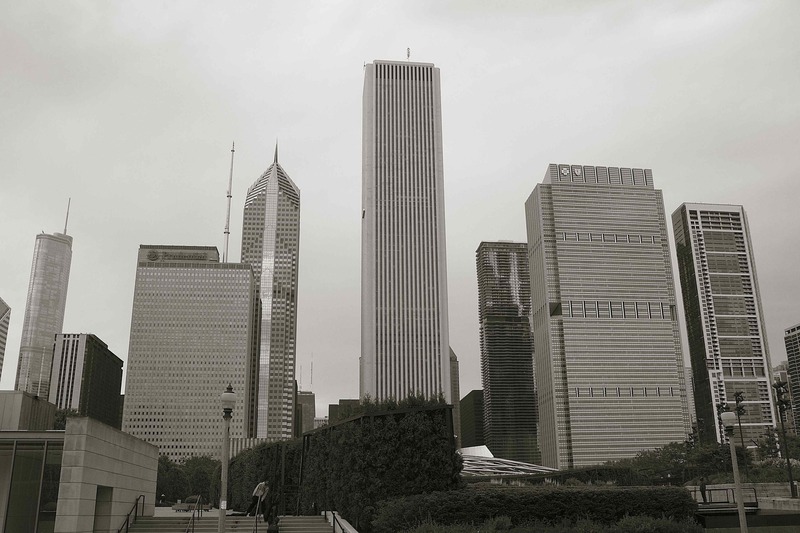 Wednesday June 05: We exercised and then drove to Schaumburg for 3 day stay in Chicago. Spent the afternoon chilling in the Springhill Suites. Dinner at the Rosebud. It is a Chicago Italian restaurant. Very good but expensive. Thursday June 06: Raining this morning so we spent a quiet morning in the hotel washing clothes, nerding out on the computer, and exercising. We ate lunch at Portillio’s Hot Dogs – a Chicago institution. Hot Doug’s is supposed to be better but I’ve never been there so don’t know. I do know Hot Doug’s is 4 blocks from where I lived from 1966 to 1968. I need to go back there and see the old neighborhood. Hot Doug’s moved in after I left. Was this a coincidence? out a way to take public transportation. 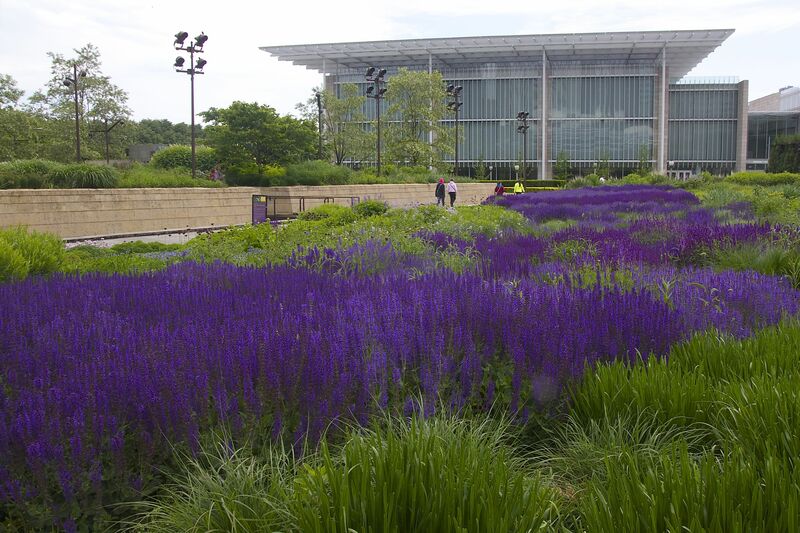 The Art Institute was great. Saw America Gothic. Also paintings by Sargent, Whistler, and Mary Cassatt. Dinner at the Ram Brewery. There seem to be good micro-breweries everywhere but Texas? Friday June 07: Spent another morning exercising and hanging around the hotel even though the Sun was shining. At 11AM we hopped the bus to Wrigley Field for a Cub/Pirate game. We froze to death, figuratively. 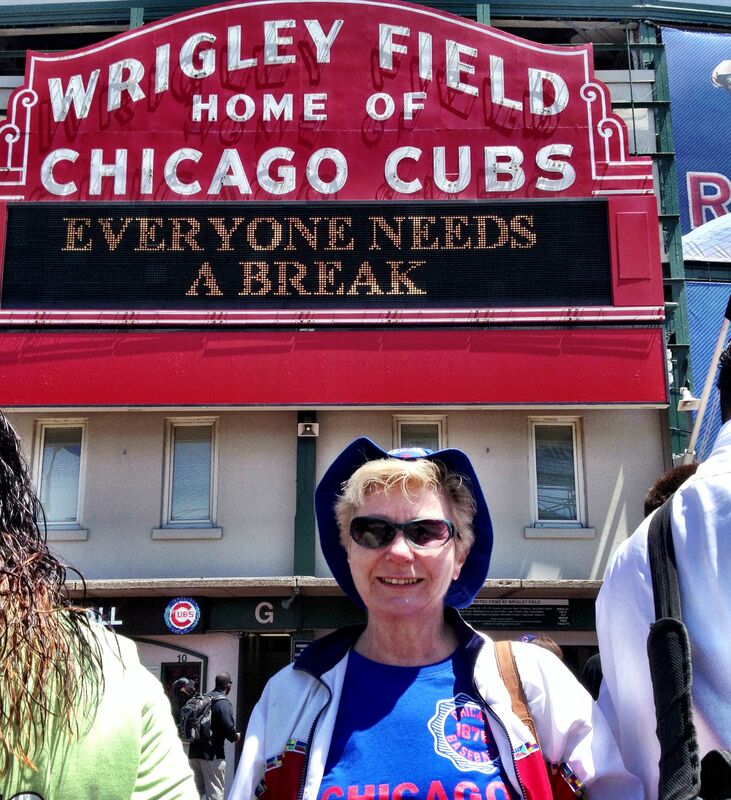 The Cubs lost but we had a great time basking in the glory at one of the shrines of America’s pastime and all. The Schaumburg bus is definitely the way to. No fighting traffic, no paying $40 for a parking spot. After arriving back in Schaumburg we went to a pre-wedding party at one of Karen’s siblings homes in Schaumburg. I can’t remember their name because I had too much to dream that night. Then we took Sara and Paxson back to their hotel and called it a night. Saturday June 08: We exercised, and checked out of Springhill Suites. 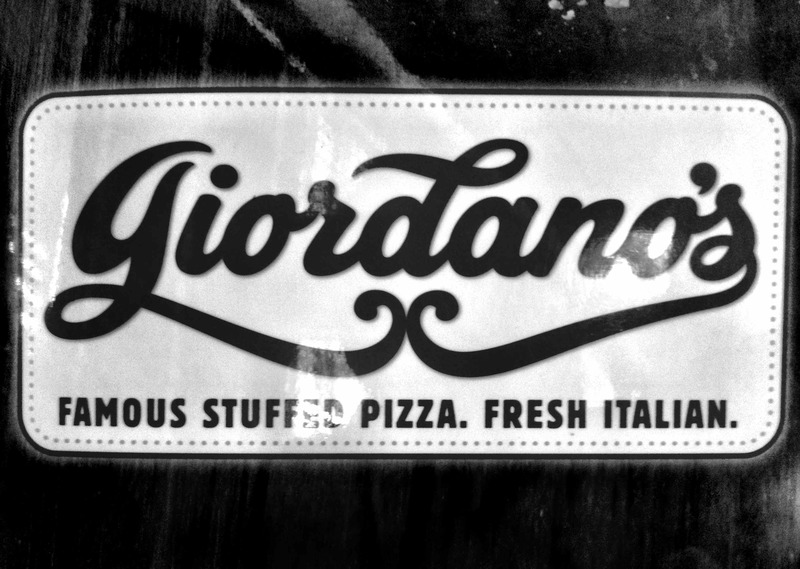 Had lunch with Mike, Sara, and Paxson at Giordano’s. Great pizza. Supposed to be the best in Chicago (Giordano says its true). Spent the afternoon at the hotel doing too much of nothing (its a song title by Peter, Paul, and Mary – I’ve been trying to fit it into a blog for years and this was my chance) while waiting for the wedding to finish. Then we had drinks with the Nuestadt family in the hotel lobby. Later we dined at Stonewood Ale House with Dave and Gretchen. The Stonewood appeard to be a great place to watch a sporting event. We ate early but people were already flocking in to grab seats for the Blackhawk Stanely Cup game. All around the bar they had two rows of satellite (?) bars and a bank of large screen TVs above the bar. We watched the beginning of the hockey match with Dave and Gretchen. At 8PM we left for Indianapolis and left them to babysit Paxson in the hotel. We arrived at the hotel there at 1:30AM. Sunday June 09: Woke up at 10:30AM and had to check check out at 11AM. I don’t believe I had slept this late since I was a teen ager. Wait, I never slept that late as a teenager. I had to get up at the crack of dawn to milk cows and slop the hogs. Of course all of this was up hill in a driving snow storm. Maybe driving late at night in an unfamiliar area when you are 66 wears the body down. Drove to Cincinnati and visited with Jim, Nancy, and Jack. 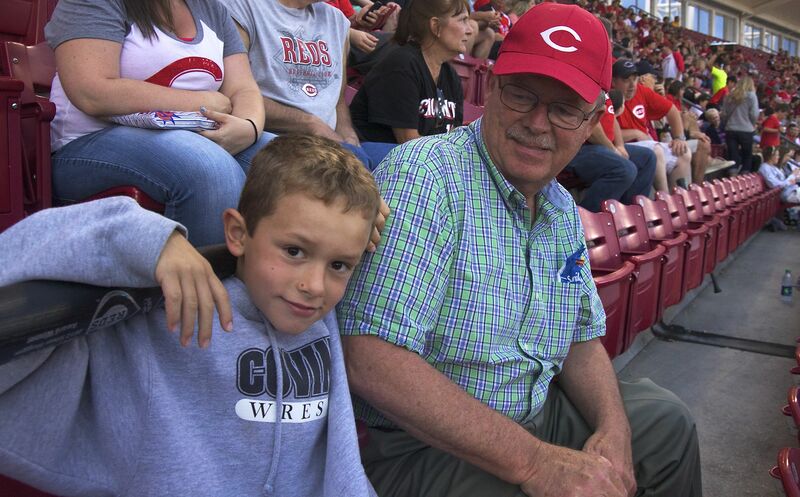 That evening we went to Reds game with Jim and Jack. They were playing St. Louis. 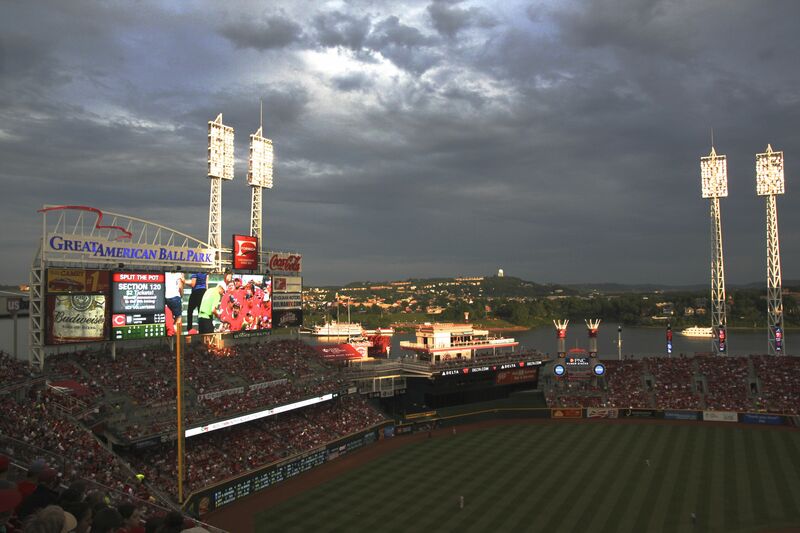 The Reds ballpark is great. The game went 10 innings but Cardinals finally won 11-4 by scoring 7 runs including a grand slam in the 10th. Jack is a real baseball fan and a real tropper. He was excited the entire game eventhough the game lasted well into the night. Monday June 10: First thing in the morning we drove to Kroger’s and bought ingredients for smoothies. If we don’t have our smoothies we turn into Chewbaccas I have been told. Then we lounged around the Jim and Nancy’s the rest of the morning. We ate lunch at Bob Evan’s. It was very good and healthy. I had bean soup and a pot roast sandwich, Then we drove to Covington to visit Brian, Michelle, Brian Junior, and Erin. We ate dinner with them at a Beppo Uno in Piqua, Ohio. I had the pizza. It was very good. 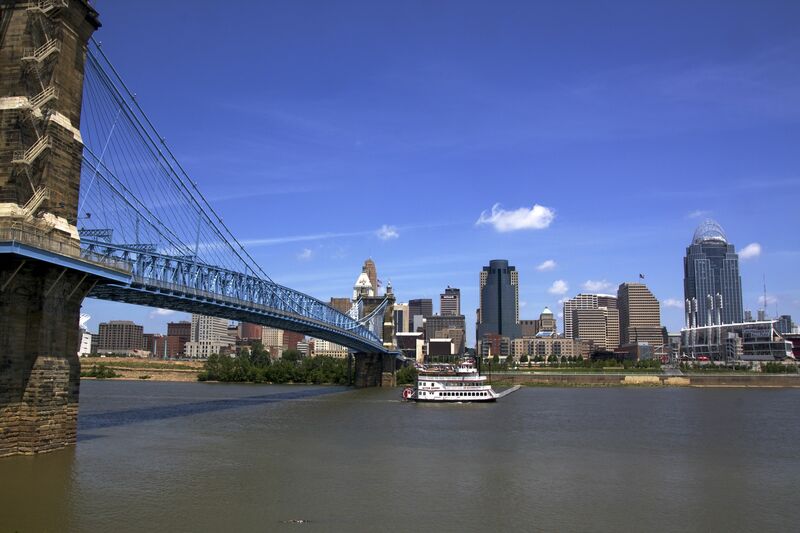 Tuesday June 11: Our last day in Cincinnati and we toured the town with Jim as our guide. First we visited Spring Grove Cemetery. It is the largest private cemetery in the U.S. It was started in 1845. The cemetery is huge and many of the monuments are huge as well. Many generations of a single family are buried in the same large plot with a huge monument marking the plot. I wonder how many cemeteries have their own web site? Seems to me social media for the dead is a market waiting to explode. Enough of that. Seems Gwen and I have started a pattern of visiting Cemeterys. On our last trip to New Orleans I drug her to the Napoleon Cemetery #1 which I know we both enjoyed. After Spring Grove, we drove downtown, ate breakfast at a really great place. I wish I could remember the name. If your ever in dowtown Cincinnati and hungry for breakfast call Jim. 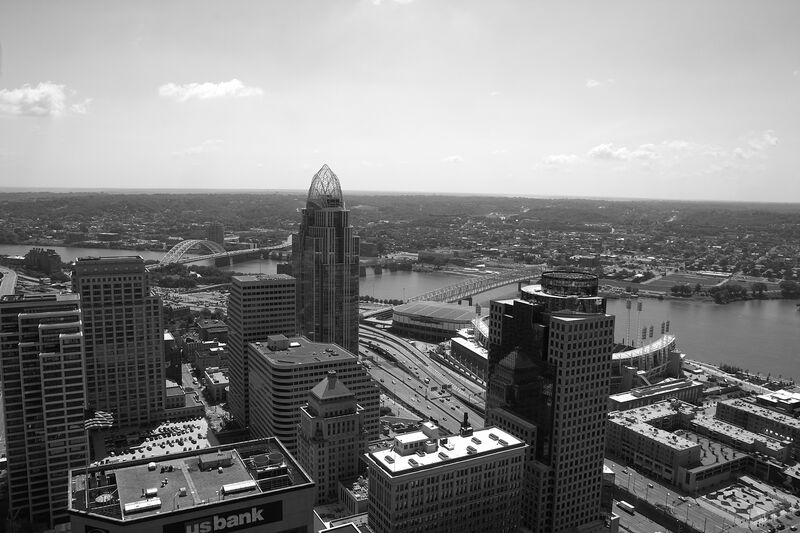 Then we took photos from the 49th floor of a skyscraper, and across the river in Covington. On the way back to Jim’s we stopped at a really cool wine bar (Marty’s Hops & Vines) and relaxed with a couple of really good craft beers. Gwen had wine of course. For dinner Jim and Nancy took us to Nicola’s in Cincinnati. Best meal of the trip!! Wednesday June 12: Drove from Cincinnati to Memphis. Very enjoyable drive. We stopped for Lunch at Buckhead’s in Bowling Green Ky. Great lunch. The trip took about 7.5 hours. If your in Memphis you have to eat barbeque, riight! The problem is there are so many joints serving great barbeque. We chose to eat dinner at Corky’s . It has been voted as best Memphis ribs for 28 years in a row. The ribs were delicious. Plus, there was a Corky’s close to the hotel. After stuffing our selves at Corky’s we drove down to Beale Street and listened to the blues. The entire street was full of parked bikes. Apparently Wednesdays in the Summer are bike nights. They really made the night special with all the noise and 100s of characters walking up and down the street drinking beer. We listened to several blues groups from the street and and finally settled on a group in the park at the end of the street. I did not get any group names but they were all awesome. On I40 in Arkansas there was a major delay with the road down to one lame. We stopped completely for 10-15 minutes. Then we would move for a bit. Then repeat. I30 at Texarkana road work was almost as bad. We simply stopped for a half hour and then drove 5 mph for 10 minutes before reaching a small group of workers patching the road. Thursday night – home at last!! Note: I never mention restaurants I don’t like. This time I made an exception of the two on the last day. They are national chains and I expect to have the same quality of service and same quality of food at ever McDonalds and Wendy’s. You are currently browsing the Number 6's Blog blog archives for June, 2013.